So, a couple of blogs ago I started off by discussing my poor chomped on bachelor button plant. Let me show you my solution to this problem. While I would prefer to have completely “natural” and unfenced gardens, this is simply unrealistic in the environment that I live in, especially with our continuing drought. As far as the wildlife is concerned my garden is a veritable supermarket of yummy water logged flowers and vegetables, just ripe for the picking. First decide on what sort of materials you are going to use. I chose hardware cloth because I wanted to make a permanent cover for my flower pot that I can use every year. Now this is not a tiny flower pot. The inside diameter of the top of the pot is about 16 inches and the pot is 15 inches tall. I had a piece of hardware cloth, left over from another project that was 17 inches tall and about 6 feet long. I simply coiled the hardware cloth inside the lip of the pot, noted where to cut the wires (leaving at least an inch or two overlap), removed it from the pot, and used my dikes to cut the wires. Let me take a moment to show you my basic arsenal of tools for this project. 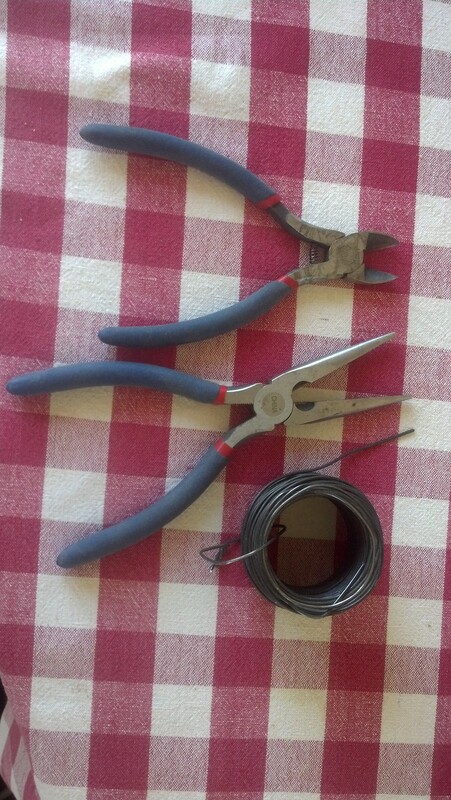 Pretty basic stuff – a pair of wire cutting dikes, a pair of needle nosed pliers, and a roll of baling wire. You may also consider having another set of pliers on hand, just in case you really need two hands for something. I usually carry a smaller set of needle nosed pliers, just in case. The red and white checked table cloth is not necessary, but it does add a nice “country” touch – yes, that is really my kitchen tablecloth. Once I had cut the hardware cloth I refit it to the pot to be sure that it was the correct size – better to find out that I had made a mistake now than after I had wired it together. 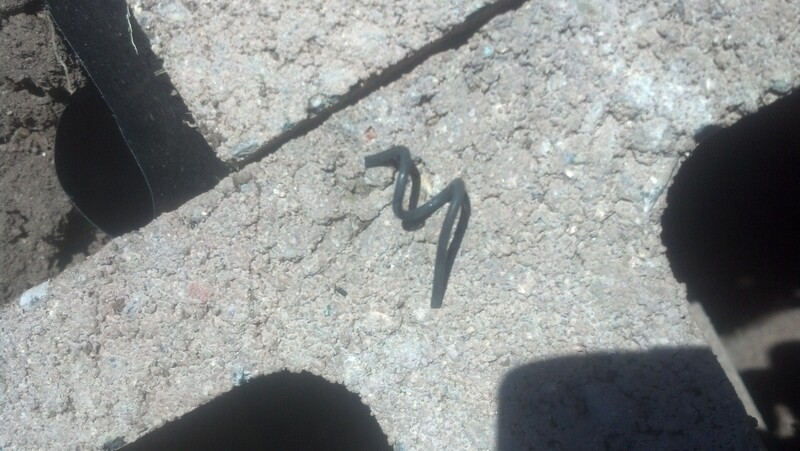 Then I used my needle nosed pliers to create spirals from two inch pieces of baling wire. This spiral isn’t very pretty, but it will still work. I simply hold the hardware cloth ends together (remember that overlap!) in the position that I want them, spin the spiral wire so that it rotates around both layers of the hardware cloth wires to hold them together and then squish the coil tighter with the needle nosed pliers to hold everything in place. Put as many spirals on as you need to to create a sturdy structure. Now I had a sturdy hardware cloth “wall” around the pot, but I still needed a top. If you don’t need a permanent top you can just cut a piece of fencing – either hardware cloth or chicken wire to fit and put a rock on top, or use zip ties or twist ties. If you need to create shade instead, just use a board or piece of plywood to cover the top. 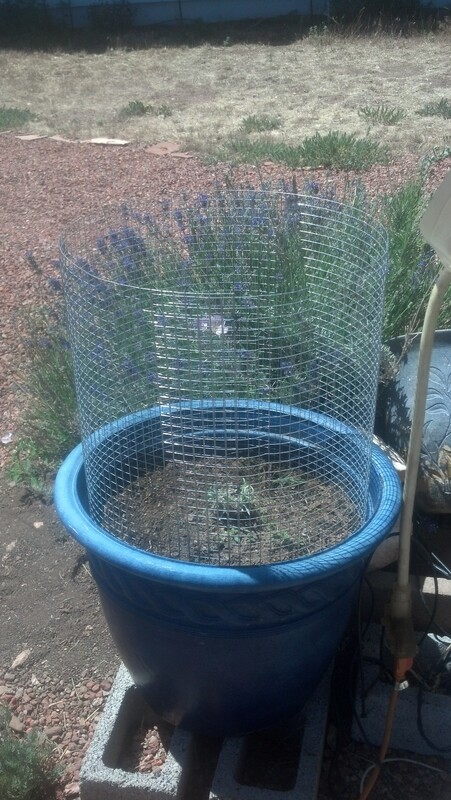 I wanted to attach a “permanent” top of chicken wire, so I cut a piece that was larger than the top of the circle of hardware cloth. I then bent the chicken wire down around the edges to form it to the hardware cloth and twisted a few of the loose chicken wire wires around the hardware cloth to anchor it in place. My flower pot cover was now complete. I can lift it off if I need to pull a weed or two. Before I put the top in place I threaded the drip irrigation in through the hardware cloth and anchored it where I wanted it with small plastic spikes. 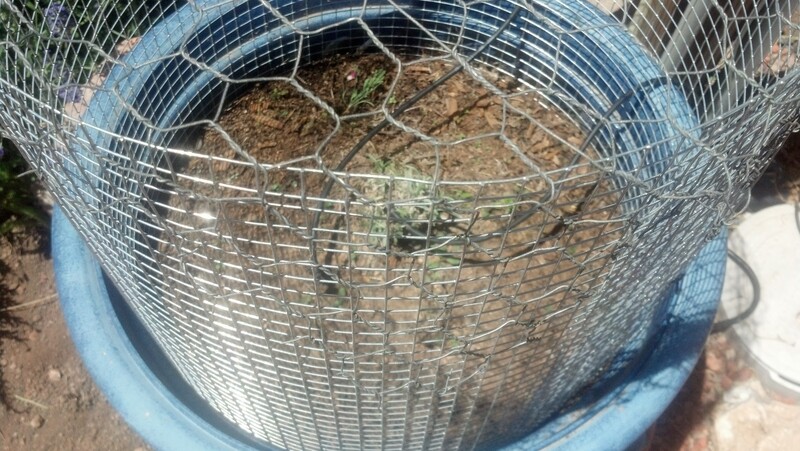 In the week since I did this the bachelor button is already beginning to perk up and the seeds that I planted are sprouting and growing in the safety of the wire cover. Next: Garden Defenses – Making Large Covers for your Garden.